Across a spectacular natural setting that extends some 200 miles from the Potomac to the James River, the story of our nation’s multi-cultural nature can be seen in Virginia’s Shenandoah Valley. For three centuries, settlers of English, German, Scots-Irish, French, and African descent moved into the Valley in waves of settlement. They carried with them varied beliefs and enjoyed the religious freedom—and solitude—the region offered. 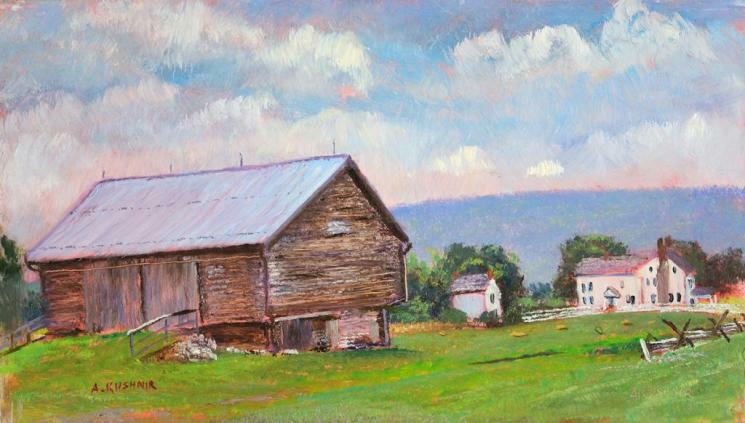 Oh, Shenandoah: Landscapes of Diversity is an exhibition of 50 plein air paintings by contemporary artist Andrei Kushnir representing the communities, farmlands, waterways, and historical sites of the Shenandoah Valley. A full-time painter since 1980, Kushnir captures the extraordinary beauty and richness of the Valley as well as the qualities that enticed pioneers—and those that followed—to settle and remain there. After experimenting with various media, Kushnir started painting in oils in 1980, and quickly discovered the joys of painting landscapes outdoors, en plein air. Essentially self-taught, Kushnir developed a naturalistic, realist style that focuses on the American landscape. Along with painting the Shenandoah Valley, he has also painted along the shores of Maine, New York, Cape Hatteras and Florida’s Gulf Coast, as well as in the Western U.S. states, particularly Colorado, New Mexico and Arizona. His work has been exhibited across the United States.